In Stitches, the embroidery boutique I bought in Elderberry Bay, also known as Threadville, came with a canoe and two paddles. Due to peculiar circumstances that you may have read about in DIRE THREADS, I no longer owned one of those canoe paddles. The canoe sped downriver. Backward. I steered, if I could call it that, with my paddle held to the side as a sort of rudder, and managed to turn the canoe, but not enough. Wallowing sideways down river, the canoe came close to tipping and dumping me into the water. I held on and forced the canoe to go down the river the way it was supposed to, prow first. The canoe and I zoomed past the park and the white gazebo. If all else failed, I told myself, I would leap out and bob to shore in my life jacket. However, at the rate the canoe was taking on water, no leaping would be necessary. The life jacket might simply float me out. The canoe’s semi-ancient fiberglass body must have weakened and cracked. By the time we reached the mouth of the river, only the gunwales were above water. I aimed my unwieldy craft toward shore. The current drove the prow into sand on the riverside beach. I clambered, water streaming from my clothes, onto hot sand. Filled with water, the canoe weighed a ton. The current would eventually tug the canoe off its sandbar and carry it downstream, where it would sink, but at the moment, it was marooned. I squelched up Lake Street past my car to my apartment. I changed into dry clothes, collected ropes from the shed, and drove to the beach. It hadn’t sunk. Wide tire tracks led to and from the section of the beach where it had been. Judging by the footprints, two men had “rescued” my sorry excuse for a canoe. Grooves showed where they had, perhaps with the help of a pick-up truck, dragged it across the sand. They had tipped the water out, leaving a wet sheen like a stain on the beach. Have you ever experienced an interesting incident involving a canoe? 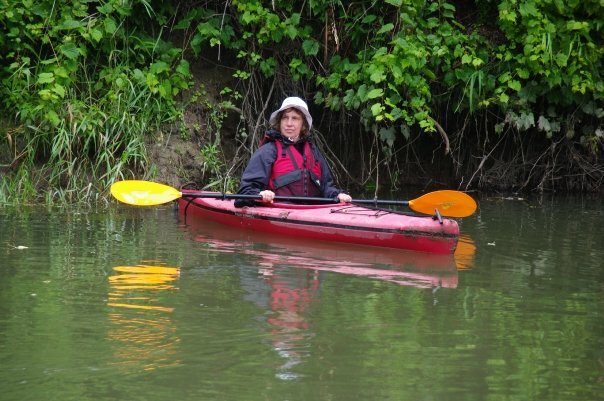 Note from Janet Bolin: I've switched, without great success, judging by the look on my face, to kayaks. You can read about Willow losing her first canoe paddle in DIRE THREADS, in stores now. 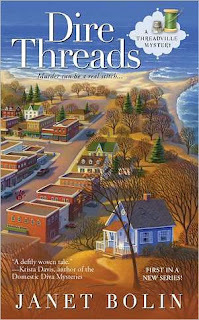 To learn more about her and her village of textile arts stores, go to Threadville Mysteries. Oh, my, that's too funny! Just glad you weren't hurt. My sister and I tried to paddle a canoe out to an island in the middle of a small lake, but some jerk in a motor boat started circling us, round and round and round. We almost swamped, but managed to get back to shore okay. Victoria, thanks. I had great faith in my life jacket. I wonder if the jerk in the motor boat might appear in one of your novels . . . I much prefer the manageability of the kayak and I'm sure you'll soon get the hang of it. Plus, the paddle is less likely to be used as a weapon. I find it unwieldy enough just using it as a paddle. I don't know about the weapon issue though, the way kayak paddles come apart in the middle - those aluminum tubes might make interesting battering rams. Glad you liked the book, Erika. I look forward to yours! I wonder if they will return your canoe. Dru, maybe they will return the canoe after they discover it doesn't float!